Honeywell announced that Zhejiang Petrochemical Co. Ltd. (ZPC) will use a range of process technology from Honeywell UOP for the second phase of an integrated refining and petrochemical complex in Zhoushan, Zhejiang Province. In the first phase of the project announced in 2017, ZPC selected Honeywell UOP technologies for hydroprocessing and heavy oil upgrading, and to make aromatics for plastic resins, films and fibers that are the basis for millions of products. For this second phase of the project, Honeywell UOP will supply a wide range of technology licenses, engineering design, key equipment, and state-of-the-art catalysts and adsorbents, more than doubling the plant’s aromatics capacity. “This second phase of the complex by itself will process 20 million tons per year of crude oil and produce another six million tons per year of aromatics when completed,” said Bryan Glover, vice president and general manager, Process Technology and Equipment, at Honeywell UOP. “It will be the largest crude-to-chemicals complex in the world, with more than 50% of the crude converting to petrochemicals.” The second phase of the project will include: 1) A two-train LD Parex™ aromatics complex — including the UOP Sulfolane™, Isomar™ and Tatoray™ processes — for the production of 4.8 million metric tons per year of paraxylene, a primary ingredient in plastics; 2) A refining section with three Honeywell UOP Unicracking™ process units to convert vacuum gas oil and distillate into petrochemical feedstock; and 3) Two Continuous Catalyst Regeneration (CCR) Platforming™ units to produce aromatics and blend stocks for making high-octane fuels, and a reverse Butamer™ unit to produce normal butane. Source: Honeywell UOP, 1/17/2019. TCGR Note: The trend towards larger integrated oil-to-chemicals (OtC) projects is well highlighted in this ZPC project, with more than 50% of the crude converting to petrochemicals. Of interest is the chosen configuration and contribution of units. For more information see TCGR’s “Oil-to-Chemicals: Technological Approaches and Advanced Process Configurations” produced in December 2017 and it’s new report “Oil-to-Chemicals II: New Approaches from Resid and VGOs” now underway. South Korea’s petrochemical majors reaffirmed capital investment plans worth nearly 14.5 trillion won ($13 billion) in total over the next five years to ready for the next expansion cycle after an anticipated downturn next year. Petrochemical exports are estimated to gain 14.6% this year. The growth is expected to stop at 0.4% next year, according to a report by the Korea Institute for Industrial Economics & Trade. In line with its capex outline, LG Chem Ltd. signed an agreement with Yeosu City to invest 2.6 trillion won to build a new facility, which will include a naphtha cracking center and manufacturing plant for polypropylene (PP), polyethylene (PE), and other high value-added products, at its base in Yeosu, South Jeolla Province. Caltex Corp., the country’s second-largest refiner, will also invest 2.7 trillion won by 2021 to build an olefins manufacturing plant or a mixed feed cracker at its Yeosu manufacturing complex. The company already signed an agreement with South Jeolla provincial government to add an olefins plant near its second refinery in August. S-Oil Corp., the third-largest refiner and wholly owned by Saudi Aramco, is prepping a project worth 5 trillion won to construct a mixed feed cracker and olefin downstream facilities near its Onsan factory in the southeastern city of Ulsan. Hyundai Chemical Co., a joint venture between Hyundai Oilbank Co. and Lotte Chemical Corp., is readying a 2.7 trillion won investment to build a heavy feed petrochemical complex at Hyundai Oilbank’s manufacturing plant in Daesan, South Chungcheong Province. The new facility will produce ethylene, PE, and propylene. Source: Pulse, 12/4/2018. TCGR Note: Of interest is the Korea Institute for Industrial Economics & Trade forecast that next year’s growth will drop from +14.6% in 2018 to +0.4% in 2019. Our reading of that must be placed in the context of a dramatic slowdown in Korean exports. We think it’s a combined effect of the slowdown in Chinese imports of aromatics and polyolefins because Korea’s pricing and costs are being pressured by the U.S. and the Middle East due to lower feedstock cost(s). Note the reinvestment by Korea is trying to address that issue. Southwest Research Institute (SwRI) is launching the Advanced Combustion Catalyst and Aftertreatment Technologies II (AC2AT™-II) consortium focusing on engine emissions solutions and innovative catalyst technologies. The AC2AT-II kickoff meeting will be Nov. 15 at SwRI’s headquarters in San Antonio and is open to interested automotive industry manufacturers. SwRI launched the AC2AT consortium in 2014. “In the first phase, AC2AT made considerable advances in understanding how complex emissions control systems affect today’s high-performance, high-efficiency gasoline and diesel engines,” said Scott Eakle, a principal engineer in SwRI’s Diesel Engine and Emissions Research and Development Department. The program developed models to predict deposit formation, growth and composition for urea-based selective catalytic reduction aftertreatment systems, characterized the complex emissions emitted from advanced combustion regimes, as well as evaluated how the physical and chemical properties of lube oil derived ash affect aftertreatment component performance. “We will build on research initiated during the first phase to further our understanding of the effects these complex emissions properties have on aftertreatment systems,” he said. For more information about the AC2AT-II consortium or to attend the meeting, contact Scott Eakle at (210) 522-5095. or visit consortia.swri.org. Source: Southwest Research Institute (SwRI), 9/5/2018. An industrial-scale pilot plant that will use surplus hydrogen from refinery operations to produce power is taking shape in Australia. Industrial alkaline fuel cell power company AFC Energy on July 12 said it received its first commercial order for a hydrogen power generation unit in Australia from Southern Oil Refining, a subsidiary of Northern Oil. AFC’s alkaline fuel cell technology converts oxygen and hydrogen into electrical energy, producing demineralized water and heat as byproducts. The company recently wrapped up a two-year pilot in Germany at an industrial plant owned by Air Products, which accepted hydrogen from Dow Chemicals. The project, POWER-UP, was a European Union–backed demonstration. The new pilot, expected to be sized between 200 kW and 400 kW, will be located at Northern Oil’s Advanced Biofuels Refinery, near Gladstone, Australia. The refinery currently converts several waste streams, including from sugarcane bagasse, “green waste” from cities, woody weeds like prickly acacia, and tires as feedstock for the production of bio-crude oil. The renewable fuel is refined into saleable kerosene and diesel products, but it requires large volumes of industrial stable biohydrogen to support the refining process. Northern Oil is developing a new hydrogen generation technology that uses steam over iron reduction and chemical looping to deliver hydrogen, processes that are reportedly cheaper than conventional steam methane reforming. Surplus hydrogen generated from this system is expected to be consumed by AFC’s fuel cell system. AFC said the pilot power system could be delivered to the Gladstone refinery in the first half of 2019. The company is now conducting engineering studies to determine the final project size, scope, contract terms, and general logistics for integration of the hydrogen power generation unit fuel system into the refinery. Source: Power, 7/18/2018. German refineries have historically relied on crude oil from Russia/CIS (35%), the North Sea (32%), the Middle East (18%) and North and West Africa (15%). However, recent decreases in North Sea production require many German refineries to source crude supplies from farther afield, incurring logistical challenges and costs. Refinery throughput in Germany grew by 2% on the year in 2017, to approximately 2 MMbpd. However, it is possible that these figures will significantly decline in 2018 due to the continuing recovery in oil prices and other factors. In response to IMO 2020, Royal Dutch Shell Plc subsidiary Shell Deutschland Oil GmbH is evaluating the potential expansion of residual processing capacity at its 140-Mbpd refinery in Wesseling, Germany. The Wesseling refinery, together with the former Godorf refinery near Cologne, form Shell’s 325-Mbpd integrated Rheinland refinery, which is one of Germany’s largest. Other leading refiners are expected to follow suit. However, tightening environmental requirements may prevent the further expansion of production capacities within the German refining industry, and may even lead to a reduction in crude processing. Germany’s refining situation is aggravated by the fact that the country has very few product pipelines, so most of its oil products are transported via truck, train and barge, with high transportation costs. BP remains a leader in the German refining market and one of the largest product suppliers in the country. The company operates two refineries—the 265-Mbpd Gelsenkirchen complex and the 82-Mbpd Lingen refinery. BP also operates its own storage terminals, as well as five additional storage locations through the JV TransTank. Competition is expected to further tighten due to the influx of major foreign players in the German refining market in recent years. One of them is Russian leading oil producer Rosneft, which increased its ownership in several leading German refineries as a result of a recent deal with BP. Among the refining assets controlled by Rosneft in Germany are Bayernoil (which provides fuel to Bavaria and northern Austria; Rosneft holds a 25% stake), MiRO in Baden-Württemberg (24%) and PCK-Raffinerie (54.17%). As a result of its deal with BP, Rosneft now holds more than 12% of Germany’s refining capacity, making it the third-largest refiner in the country and one of the largest in the EU. Rosneft considers the German refining industry to be a promising area for future growth. The company plans to allocate up to €600 MM ($707 MM) for the development of the sector over the next 5 yr. The 2008 financial crisis and market stagnation of 2009–2016 accelerated the process of rationalization in the European refining sector, which retired 2.35 MMbpd of capacity. Over the last few years, German refining investments have focused on increasing diesel production. However, sophisticated refineries in other regions are flooding the market with low-priced middle distillates, making domestic fuel production less lucrative. Furthermore, rapid growth in distillation and conversion capacity in the Middle East and Asia threaten the German refining sector. The German refining system, with its relatively lower complexity and utilization, faces difficulty in competing against newer, larger, more sophisticated refineries. Source: Hydrocarbon Processing, 6/2018, p.17. In an effort to diversify their economies, national oil companies from the Middle East and North Africa are investing in chemicals, where they see attractive growth and sustainable prospects. Abu Dhabi National Oil Co. (ADNOC) plans to invest $45 billion, with partners, in its refining and petrochemical complex in Ruwais, United Arab Emirates. Qatar Petroleum and Algeria’s Sonatrach are also spearheading multi-billion-dollar investments. The plans come on the heels of an initiative announced last month by Saudi Aramco to spend $60 billion on petrochemical and refining projects in the U.S., Saudi Arabia, and India. ADNOC says it wants to make Ruwais “the world’s largest and most advanced integrated refining and petrochemical complex.” It will add a refinery to the site, increasing capacity more than 65% up to 1.5 million barrels per day, by 2025. In chemicals, the company plans a mixed-feed ethylene cracker that will triple the site’s petrochemical output to 14.4 million metric tons by 2025. The cracker is an amplification of plans ADNOC and European polyolefins maker Borealis unveiled last year to up capacity in Ruwais to 11.4 million metric tons by 2023. ADNOC is also establishing two industrial parks on nearly 10 km2 of land meant to attract makers of specialty chemicals and other products to Ruwais. ADNOC has already signed on the Spanish firm Cepsa to build a plant for the surfactant raw material linear alkylbenzene (LAB). In Algeria, meanwhile, Total and Sonatrach are planning a $1.4 billion propane dehydrogenation (PDH) and polypropylene (PP) plant with 550,000 metric tons of annual output. A decade ago, the two firms planned a cracker project that didn’t materialize. Source: Chemical & Engineering News (C&EN), 5/21/2018, p.12. The outlook for motor fuels is having a strong, increasing influence on petrochemicals capacity investments and promises to rattle the chemical industry status quo. Any company involved in steam cracking and businesses immediately downstream needs to develop scenarios and strategies taking into account the new reality. The world’s big refiners look at tomorrow’s world and see stagnant and probably regionally declining motor fuels demand. The shift in motor fuels demand means that the world’s big refiners are looking at their business differently, eyeing possibly above-GDP petrochemicals growth, replacing that lack of demand from the auto industry. The petrochemical business becomes, as a result, not just a (recently) profitable adjunct to the main thrust of what they do but the generator of product streams that command a great deal more attention. Refineries will, in the future, be run to produce more petrochemical feedstocks and more petrochemicals. An increasing proportion of the oil barrel will be used for petrochemicals – and plastics – manufacture. The problem for the oil refiner is that, currently, the proportion is low, but it is likely to take over as the main source of growth post 2030. Given that scenario, think about the pressure on the oil companies to make more, higher growth products, profitably. Think about the liquid feedstock streams – naphtha and liquefied petroleum gases (LPG) – that will be produced and needed for petrochemicals. Also think about the heavy products from the refinery, including even, perhaps, petroleum coke, that could be used to produce petrochemicals – in this instance, methanol. The influence of the non-integrated petrochemical producers is likely to diminish, with those companies facing a significant competitive disadvantage. Chemical companies will continue to push further downstream or into specialized niches. The world of petrochemicals will be dominated by big oil. Source: ICIS Chemical Business, 4/20/2018, p.10. TCGR Note: It was also announced this week that KBR will do the FEED study for the Aramco-SABIC project. For more information on the technologies that will be used for the direct oil to chemicals conversion, see the following article. In 2017, OECD natural gas production grew by 2.4% compared to 2016. This growth was driven by increases particularly in OECD Asia Oceania (+17.7%), whilst the OECD Americas (1.1%) and OECD Europe (0.4%) saw moderate growth. 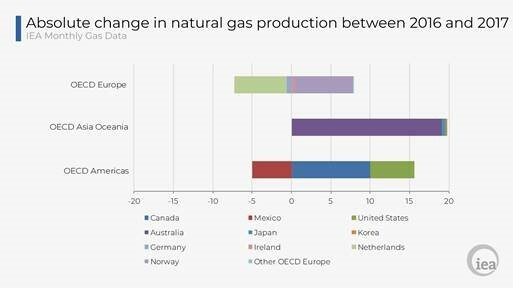 OECD Americas continued to account for nearly three quarters of the total OECD natural gas production in 2017. Indigenous production in OECD Asia Oceania was almost 20 bcm higher in 2017 than in 2016, driven by growth in Australia (+20.5%), where production increased in Surat-Bowen and the Carnarvon basin, along with the beginning of production at the Wheatstone LNG project in October 2017. Total OECD annual production of crude oil, NGL, and refinery feedstocks increased by 2.6% in 2017 compared to 2016. This trend was driven by the OECD Americas (+3.5%), whilst production decreased in OECD Asia Oceania (-8.7%) and OECD Europe (-1.1%). The United States experienced the highest growth, in absolute terms, despite the effects of Hurricane Harvey in August 2017, increasing production by 4.7% or 25 million metric tons (Mt). Canadian production also grew (+7.8%) on an annual basis, partially due to the recovery from the 2016 wildfires in Alberta. Meanwhile, Mexico experienced the largest decline (-9.6%) in production amongst OECD countries. OECD Europe’s production decline was driven by Norway (-0.8%) and the United Kingdom (-2.0%). Italy’s production recovered by 8.6% as the Val d’Agri field restarted production. The decline in OECD Asia Oceania’s production was primarily due to Australia, where production fell by 9.6% or 1.5 Mt. Refinery gross output of total products within the OECD increased by 1.2% or 23.2 Mt in 2017 with all OECD regions contributing to this growth. OECD Europe’s output grew (+1.9%) despite the fire incidents at the Pernis refinery in the Netherlands and the Leuna refinery in Germany. Total gasoline was the only product category experiencing a decline (-1.2%) in the region. The OECD Americas’ growth (+0.8%) was led by the United States (+1.4%), in absolute terms, followed by Canada (+6.4%). Mexican output declined (-19.0%), partially due to the fire incident at the Salina Cruz refinery, while Chile’s output remained relatively flat (+0.3%). Growth in OECD Asia (+0.8%) was driven by Korea (+5.2%), where notably the output of naphtha increased by 15.7%. Japan’s reduced output (-2.5%) was primarily due to a 15.9% decline in residual fuel oil output. Source: International Energy Agency (IEA), Key Natural Gas Trends 2017, Key Oil Trends 2017, 4/12/2018. TCGR Note: Despite the stories, we have also reported about the net increases in renewable energy taking a larger share of energy consumption worldwide. It is interesting to highlight, probably based on the worldwide positive economic growth and outlook, the total production of crude oil, NGL and feedstocks in 2017 increased +2.6% compared to 2016. However, note the overall OECD decline in gasoline by -1.2%. Bahrain will invite international oil companies to help it develop its first major discovery in decades, hoping to begin production within five years. Production from the new discovery could one day reach 200,000 barrels a day, according to Abdulrahman Ali Buali, a member of Bahrain’s Council of Representatives. The amount of oil and gas that can be recovered from hard-to-reach pockets in shale rocks under the sea is uncertain, and development is potentially an expensive proposition. Halliburton Co. will drill two wells this year in the offshore Khaleej Al Bahrain Basin to appraise how much of the oil contained underground is actually recoverable. Bahrain estimates there are 81.5 billion barrels of shale oil and 13.7 trillion cubic feet of natural gas of resources in the basin. Oman’s Rub Al-Khali Basin area contains an estimated 24 billion barrels of oil, but only 1.2 billion barrels are “technically recoverable,” according to the U.S. Energy Information Administration. Jordan’s Wadi Sirhan Basin resource holds about 4 billion barrels, and just 100 million can be extracted, according to the EIA. Both deposits are onshore. Source: Bloomberg, 4/4/2018. TCGR Note: Here comes the Middle East to shale oil & gas and fracking. This all sounds easy, but my require different methods and skills for recovery, so it will not be a one-size-fits-all solution for each basin. Also, drilling and recovery off-shore can be significantly more costly, so that opportunity needs to be evaluated separately.